Add these classic round cubic zirconia stud earrings to your jewellery collection today. 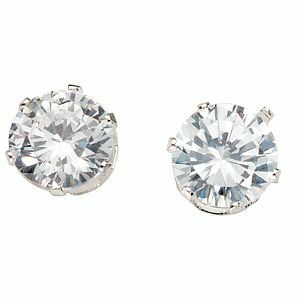 Silver Round Cubic Zirconia Stud Earrings is rated 4.5 out of 5 by 10. Rated 5 out of 5 by Anonymous from Love this ear ring This is my fourth purchase of this ear ring. Best idea for a gift. The only down fall is the lock of the ear ring other than that it’s very elegant and looks good on the ears. Rated 5 out of 5 by Anonymous from Look more expensive Good quality, very sparkly. Look like they are more expensive than they are! The backs fit nice and tight.